The first step towards creating your website is selecting a Template. We offer different types of templates which you can use to create your website. Basically, there are 5 types of templates available including, Classic, Traditional, Modern (Hybrid), Revo, Physical Only and Audio Only. Modern Template is activated for your website by default. Later on you can switch to a different template (For Example, from Modern to Classic Template and Modern to Physical Only Template etc.) according to your needs or you can also modify the existing template with our Template Editor feature. (That is, you can modify our Classic, Traditional, Modern, Modern Lite and Physical Only template according to your requirement). To select a Template, go to “Website” –> “Templates“ –> “Manage Template” in your CMS. (See Below Screenshot). Under “Manage Template” page, you can see 2 Templates. 1. Classic and 2. Traditional. Select the template according to your preference. 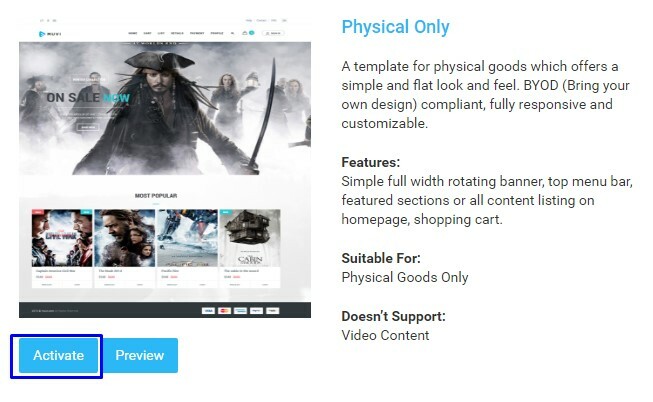 You will be able to see “Physical Only” template along with the above 2 templates, if you have selected the option Physical during FREE Trial or you have activated Muvi Kart feature from “Marketplace” in your CMS. Click Here to activate Muvi Kart. You will able to see “Audio Only” template, if you have selected the option during FREE Trial or you have selected it in “Manage Content “–>“Settings” in your CMS. Modern template is activated by default for your website. If you have another template activated, then you can change to “Modern” by clicking on the “Activate” button. Before activating the template you can preview it by clicking on the “Preview” button. (See Below Screenshot). This is a Hybrid Template. 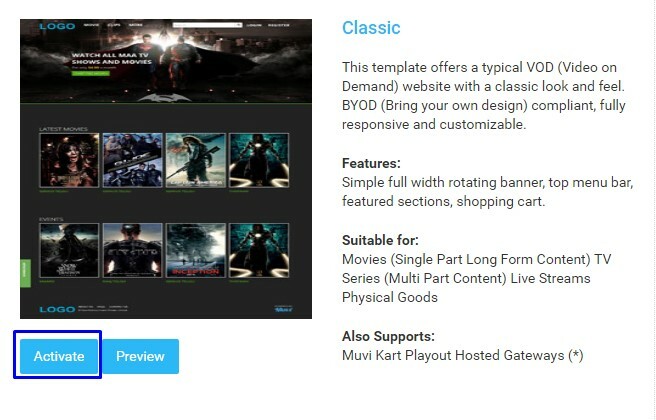 Along with Video On Demand content, it also supports Audio On Demand and Muvi Kart content. 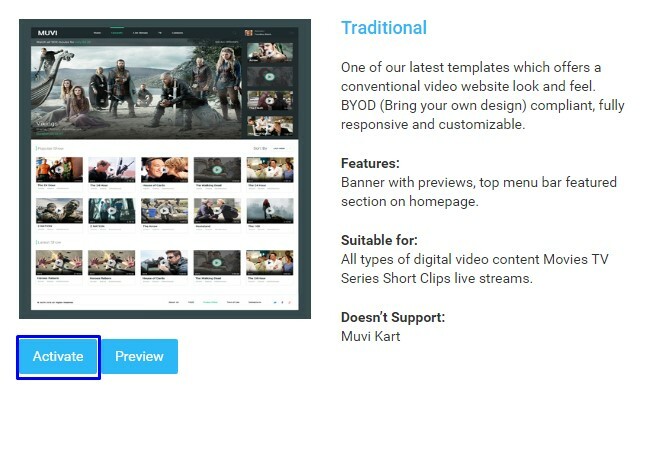 So, if you wish to create a store where users can watch movies, do online shopping and listen their favorite music, then you should select this template. 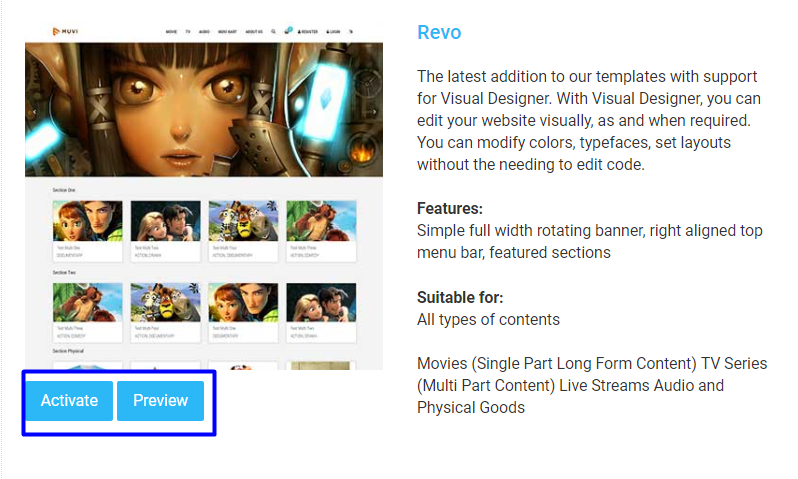 To activate the Revo template please click on “Activate” button under the template. When you click on Activate, a dialog box will open with “Yes” and No” option. Click on “Yes” to activate the template. To activate the Traditional template please click on “Activate” button under the template. To activate the Classic template please click on the “Activate” button under the template. Select “Physical Only” template, if you want to create a standalone online physical goods store or Muvi Kart. This template is not initially visible in the “Select Template” page. First you need to activate the “Muvi Kart” feature from “Marketplace” in your CMS. Then the template will be visible in the Select Template page. Click Here to activate the Muvi Kart feature. Before activating the “Physical Only” template, you can preview it by clicking on the “Preview” button. (See Below Screenshot). Click on “Activate” button. When you click on Activate a dialog box will open with “Yes” and No” option. 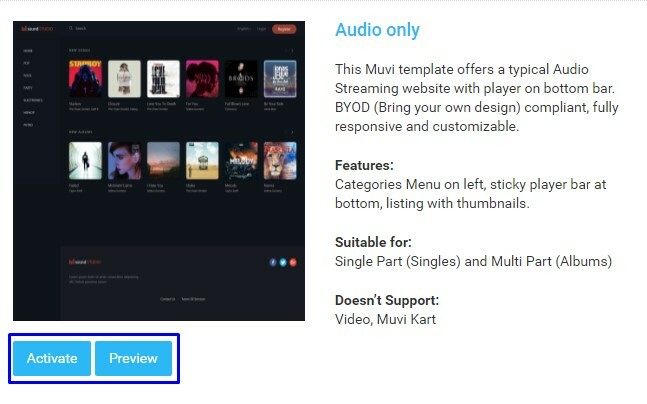 Select “Audio Only” template, if you want to create an audio streaming platform. This template is not initially visible in the “Manage Template” page. First you need to select “Audio-on-Demand” in your CMS. Go to “Manage Content” –>“Settings” and then select the check box “Audio-on-Demand” in your CMS. Then click on “Save“. To activate the Audio Only template please click on “Activate” button under the template. You can switch from one template to another as per your requirement. By switching template, you will not lose any information such as, banners, featured content etc. apart from the features that the new/existing template might support. Certain features will not appear on specific templates. 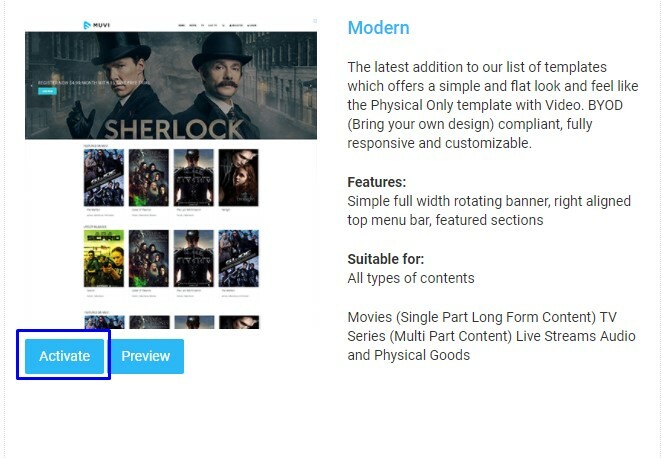 For example, if you will switch from Modern Template to Classic then you will not see the Audio on Demand feature content on the Classic Template. We also provide template editing feature. By using this feature you can customize the above 4 templates according to your specific needs. The changes can be made to the existing templates with our “Template Editor” or “BYOD (Bring Your Own Design)” feature. In order to use these template editing feature you must have sound knowledge of HTML, CSS, Java Script etc. You can also take help of someone who has knowledge about this. Please go through our help article, “Editing Template” to know how to make changes to the template.